10in Young Scientist Anatomy Set designed by Roman Emms and manufactured by Humbrol. Mr. Emms, who has designed toys for Disney and created Thunderbirds models, was paid less than £2,000 for the model on which the 10in high anatomy set was based. He said: I'm a commercial sculptor not an artsy-fartsy sculptor. My sculptures are mainly for merchandising. If I had done a 20ft one, who would have known it? 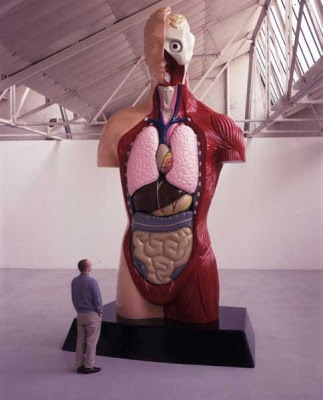 Damien Hirst, Hymn, 1999. Hymn is 20ft tall and also made out of bronze. Hirst sold Hymn to the art collector and gallery owner, Charles Saatchi, for £1 million. 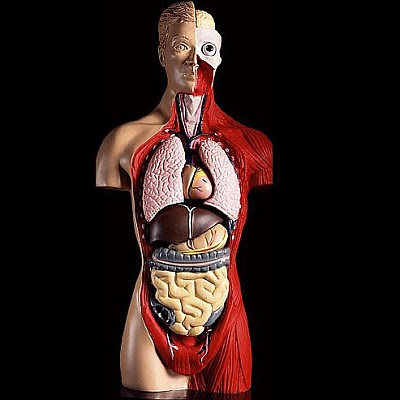 The toy manufacturer, Humbrol, later sued Hirst because Hymn is an exact replica of their 10in Young Scientist Anatomy Set designed by Roman Emms. The artist Damien Hirst has agreed to pay an undisclosed sum to head off legal action for breach of copyright by the designer and makers of a £14.99 toy which bears a remarkable resemblance to his celebrated 20ft bronze sculpture Hymn.